Google will be bringing some extra social media functionality to its products with the purchase of Wildfire. Jason Miller, Product Management Director, posted on Google's official blog that they had bought social media startup Wildfire with the intention of helping Google users to "manage their pages, apps, tweets, videos, sponsorships, ads, promotions and more, all in one place." The four-year old social media startup is currently used by brands such as Virgin, Cirque du Soleil, Gilt Group and Spotify to manage their social efforts across numerous social websites. The co-founders, Victoria Ransom and Alain Chuard, and their team will be joining Google and the service will be brought into add extra functionality to Google's suite of advertising and analytical tools with the aim of creating "better and fresher content" with "more meaningful interactions." Miller explained "With Wildfire, we're looking forward to creating new opportunities for our clients to engage with people across all social services. We believe that better content and more seamless solutions will help unlock the full potential of the web for people and businesses." 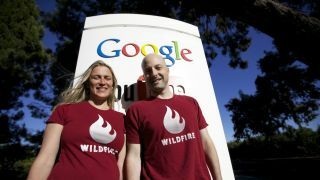 The Wildfire co-founders announced on a blog post on their website: "We believe that over time the combination of Wildfire and Google can lead to a better platform for managing all digital media marketing. For now, we remain focused on helping brands run and measure their social engagement and ad campaigns across the entire web and across all social services — Facebook, Twitter, YouTube, Google+, Pinterest, LinkedIn and more — and to deliver rich and satisfying experiences for their consumers. To this end, Wildfire will operate as usual, and there will be no changes to our service and support for our customers."